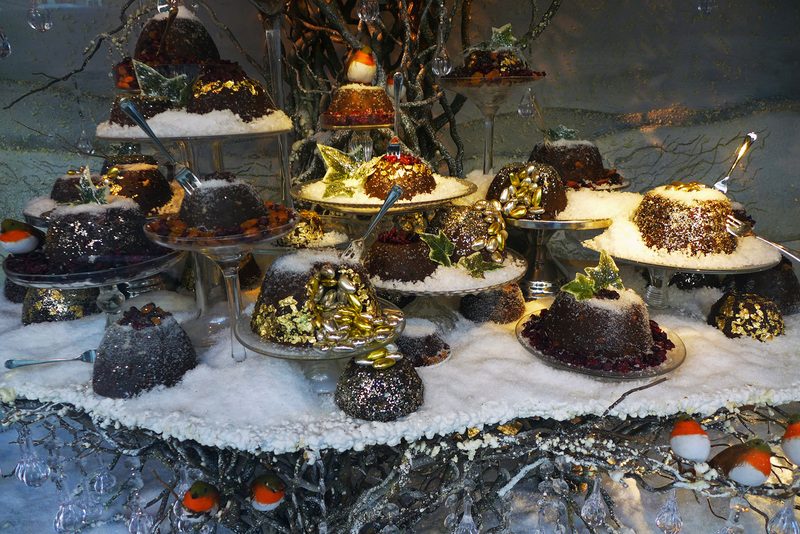 THE LONDON RITZ – A very special Sunday lunch to finish off 2014. The final restaurant of my pre Xmas foodie trip to London and my official festive wind down was well underway and the last blog post of 2014. I always save the best to last and after an amazing year of worldwide travels my final UK meal of 2014 was saved for my very favourite restaurant in the UK , the London Ritz. 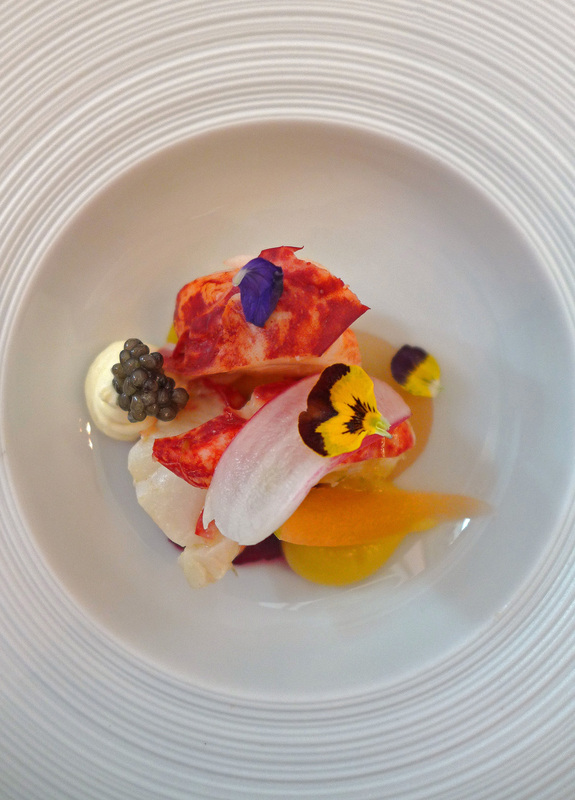 Now i`ve already blogged this place a few times but I still can`t resist showing off the classic delights and the tremendously talented skills of the Ritz kitchen team. My menu today consisted of 10 courses , 5 of them would be savoury and 5 sweet. 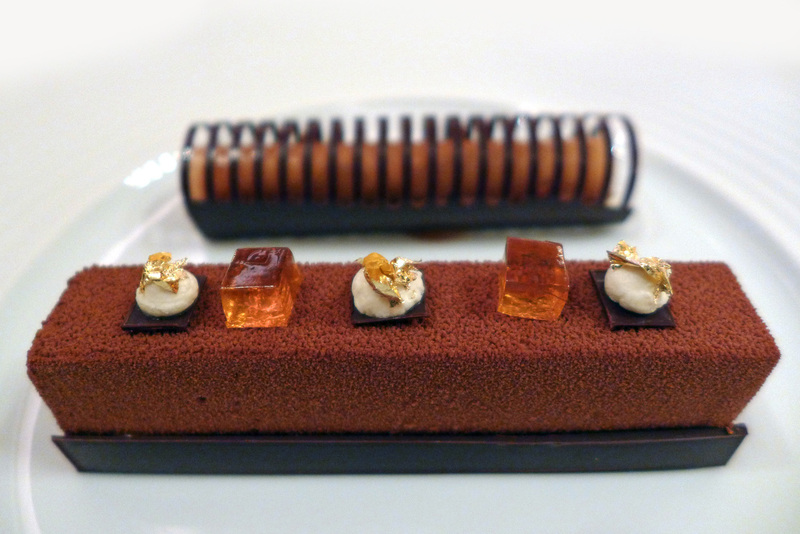 Ohhhh jeez , I love my desserts and what better than having the Ritz head pastry chef Lewis Wilson come in to work on his day off to prepare them all for me….I`m very blessed. I`ve eaten a lot of meals over the years in restaurants all over the UK and my own personal views are that there is no better pastry chef working anywhere in this country. A highly skilled and dedicated young gent and an absolute master of his art. A far cry from his strange hobby of photographing Graffiti and men in tight leather… ( on motorbikes ). I get the most amazing feeling simply by walking through the door into the hotel here , it just oozes class and history and carries such wonderful memories of some of the best meals of a lifetime. 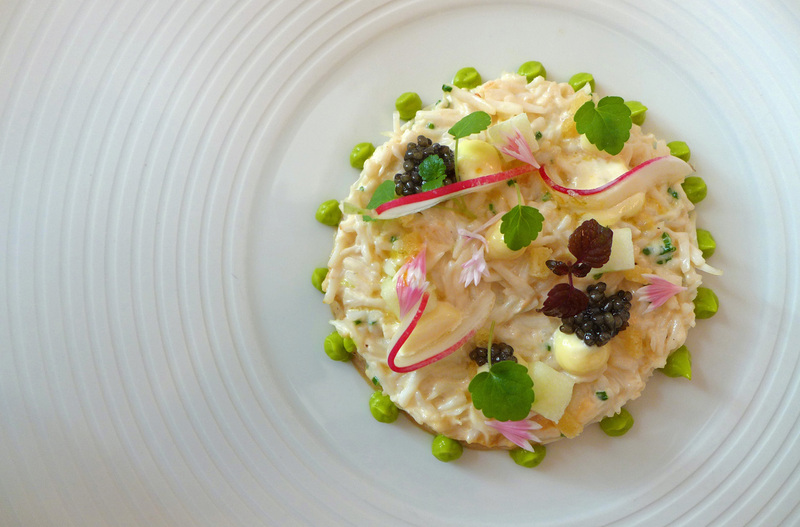 Service as usual is perfection with each of the staff members meticulously trained to the highest of standards. Wine service , well what would you expect at the Ritz ? say no more. 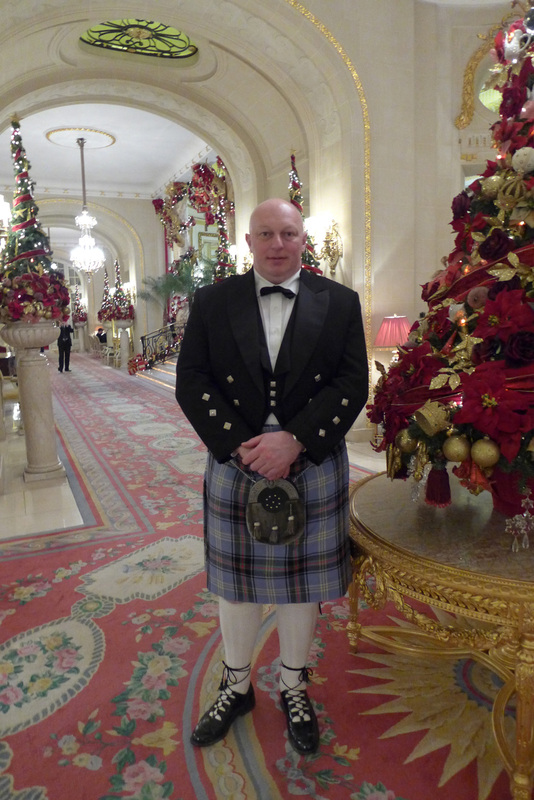 The Xmas choir and the Harpist take it in turns to entertain in the lobby and afternoon tea dining areas whilst the forever smiling Pianist entertains in the Ritz restaurant. I always feel so special in there as the lady always remembers to play my special tune “ From Russia with Love” recreating happy memories of feeling like Bond , James Bond and sharing some wonderful meals with my dearly departed best friend, bodyguard , and other half of the comedy duo – “The Laird” …. Gone but never forgotten. The main reason why the Ritz will always hold a very special place in my heart. So on to Sunday lunch. 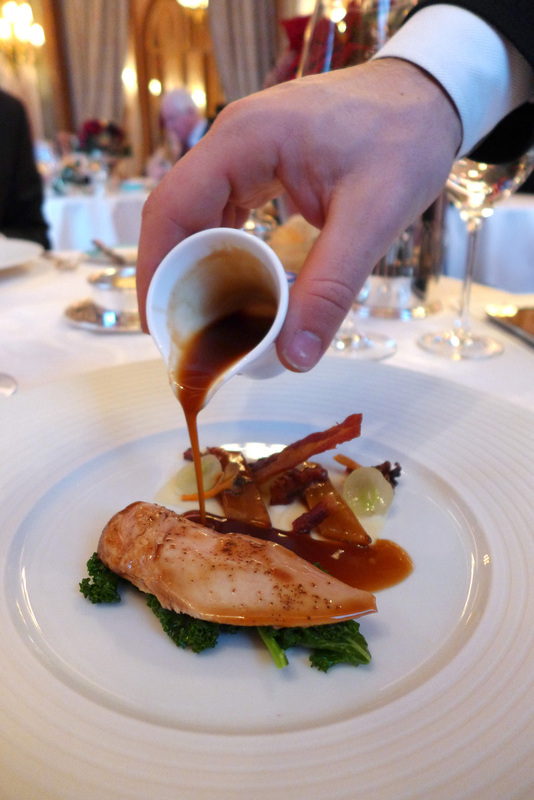 There`s actually a couple of choices and the best value by far is the Ritz set Sunday lunch for £49. This consists of a 3 course meal with a couple of complimentary treats added. 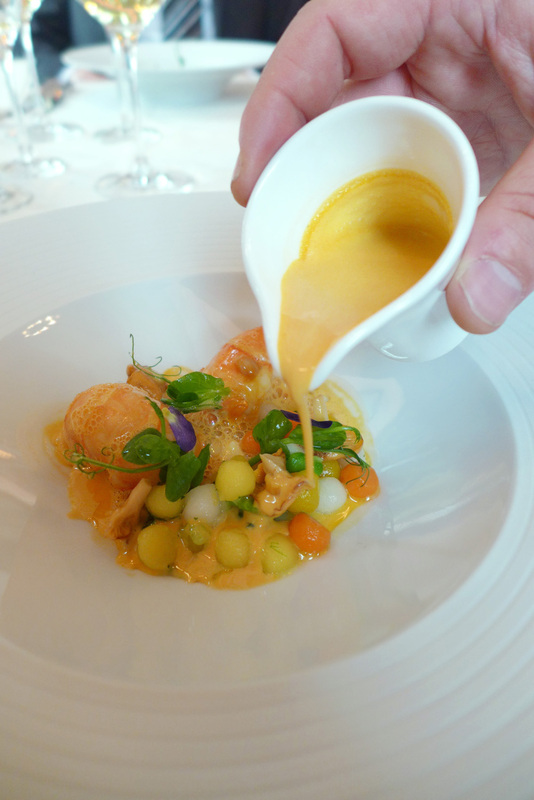 Then there`s the `a la carte` where dishes are priced individually. 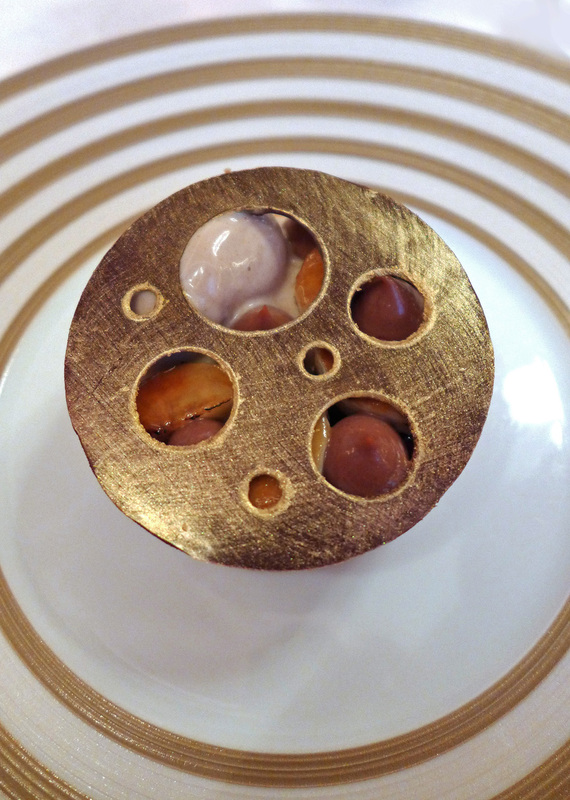 For those feeling a little adventurous then there`s always the option of the Ritz tasting menu consisting of several courses of seasonal delights priced at £95. I just like to let Chef cook whatever he wants to send to me. It`s a lovely surprise because I don`t know what to expect and I always get any `one offs` that arrive fresh that day with the morning order. 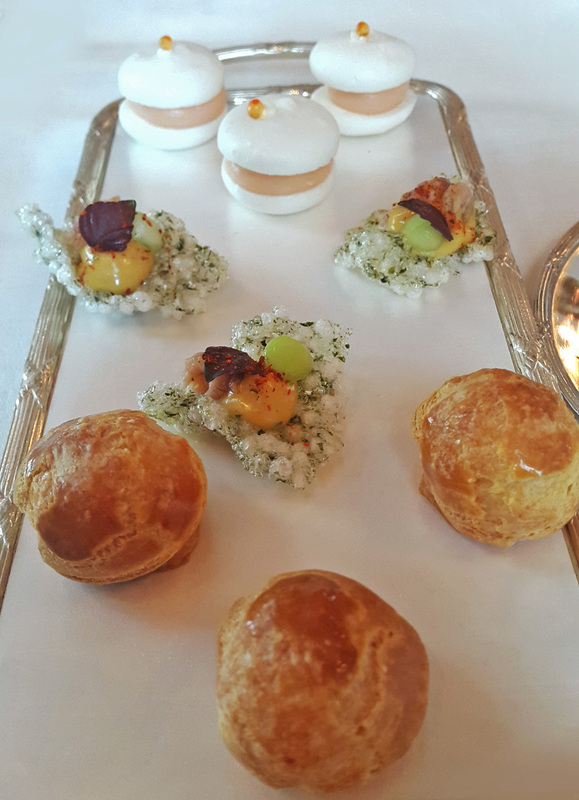 Selection of Ritz Classic Canapes. – Cheese Gougere , Smoked Salmon Macaroons , Prawn and Seaweed crackers. 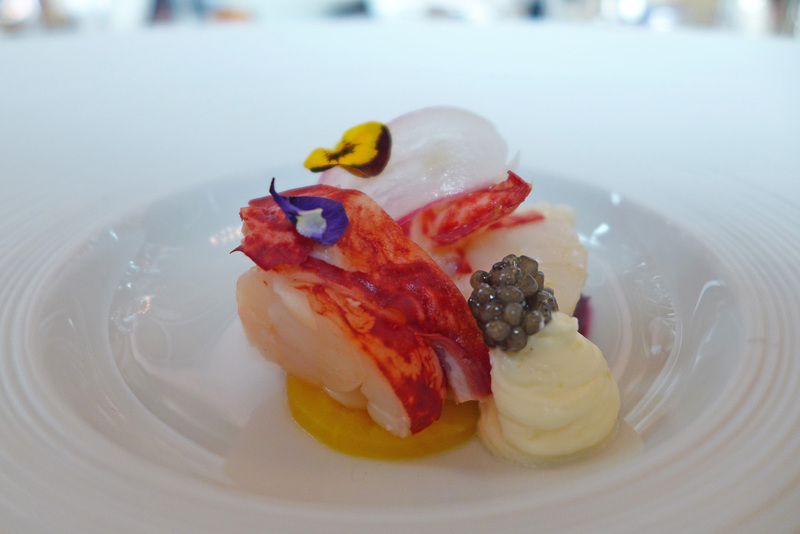 Lobster , Mango , Melon , Caviar amuse bouche. 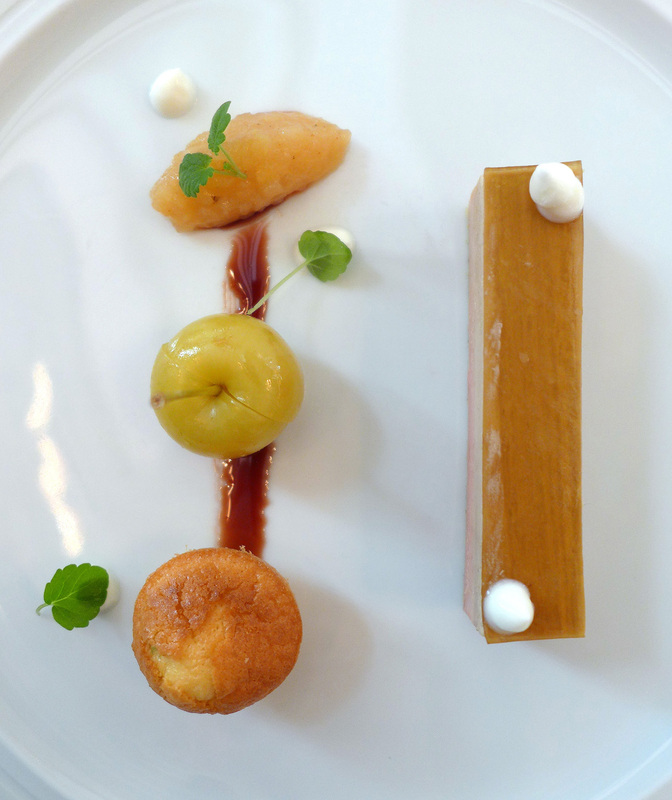 Goose Liver ( foie gras ) with Quince , Almond cake and Yoghurt. 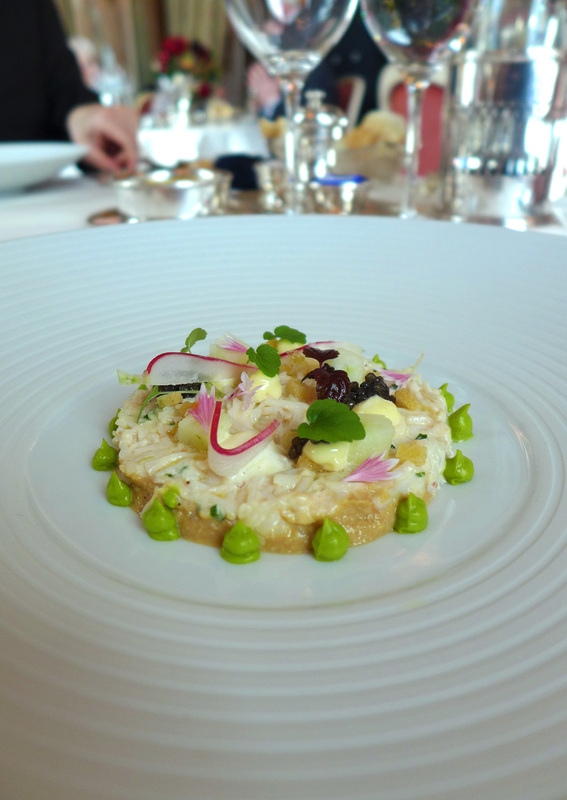 Dressed Crab cocktail with spiced Avocado and Radish. 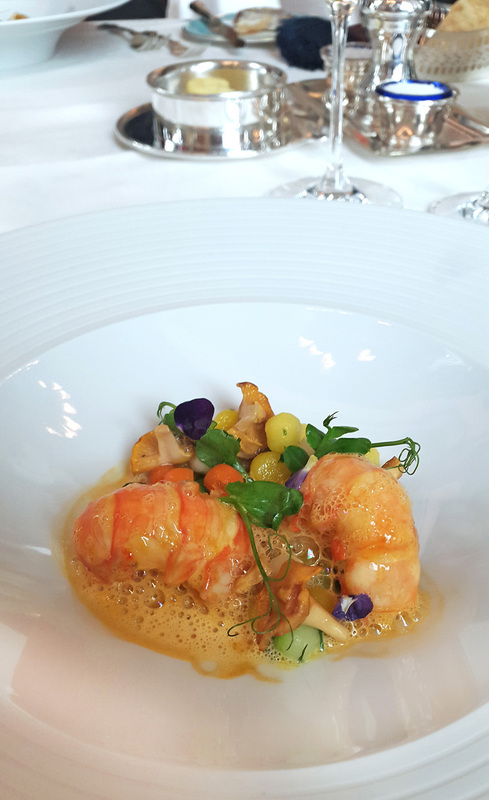 Scottish Langoustines with Heritage root vegetables , Chanterelles , Pea shoots and Langoustine cream reduction. 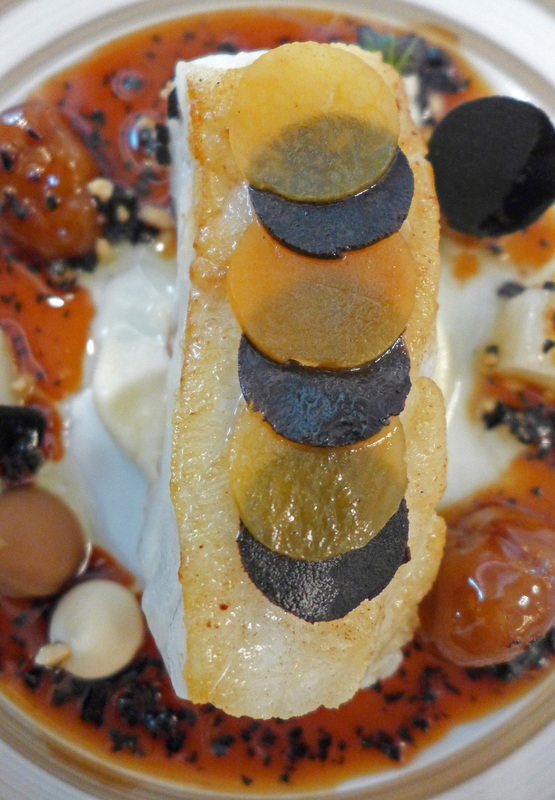 Turbot with Pumpkin , Mussels and Lobster sauce with candied Chestnuts and Black Truffle. 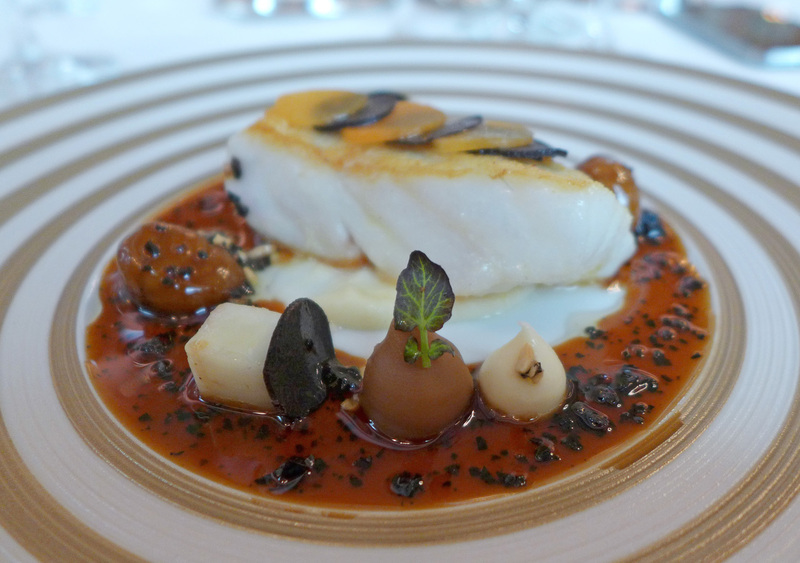 The finest fish that swims in the sea paired up with the Black diamonds of the Perigord….Do I really need to say any more ? 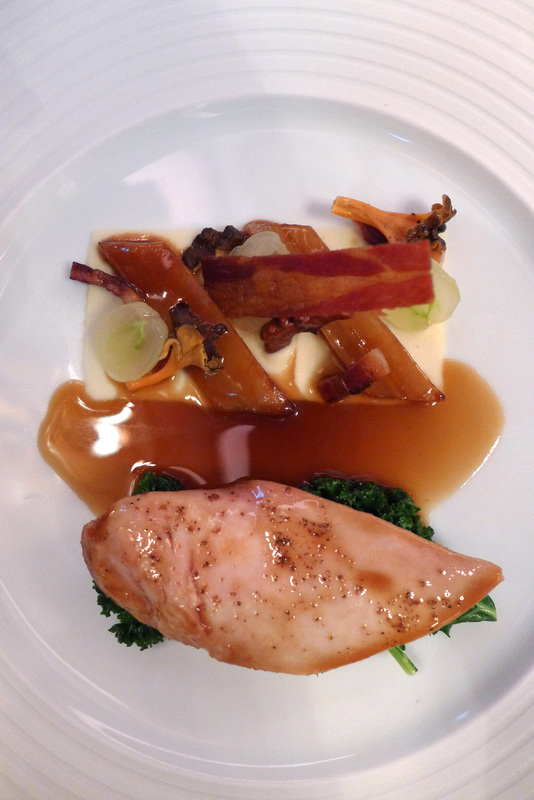 Roasted Partridge with Celeriac , Bacon , Walnut and Salted Grapes and a sauce made from the goodness of the bones. 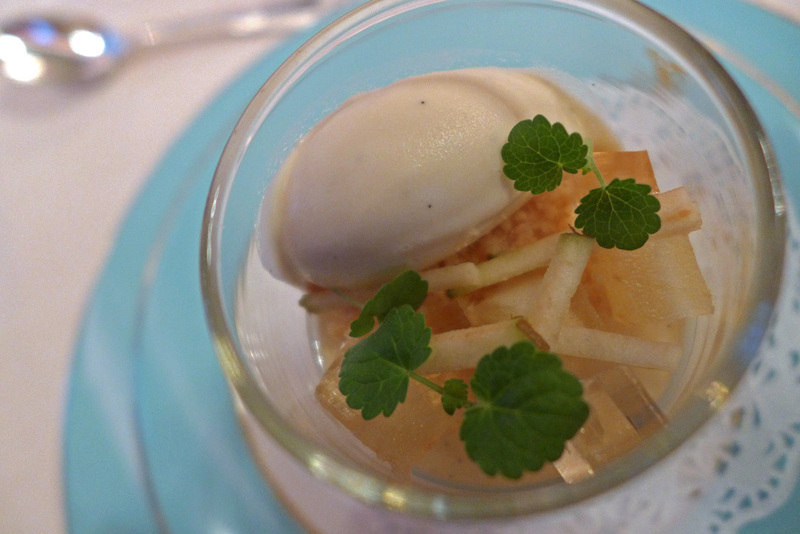 Apple and Sauternes – This was a little pot of goodness served up just to get the taste buds on to the sweet treats that were to follow. Sauternes Cheesecake with Sauternes ice cream , compressed Russett Apple and Apple jelly. 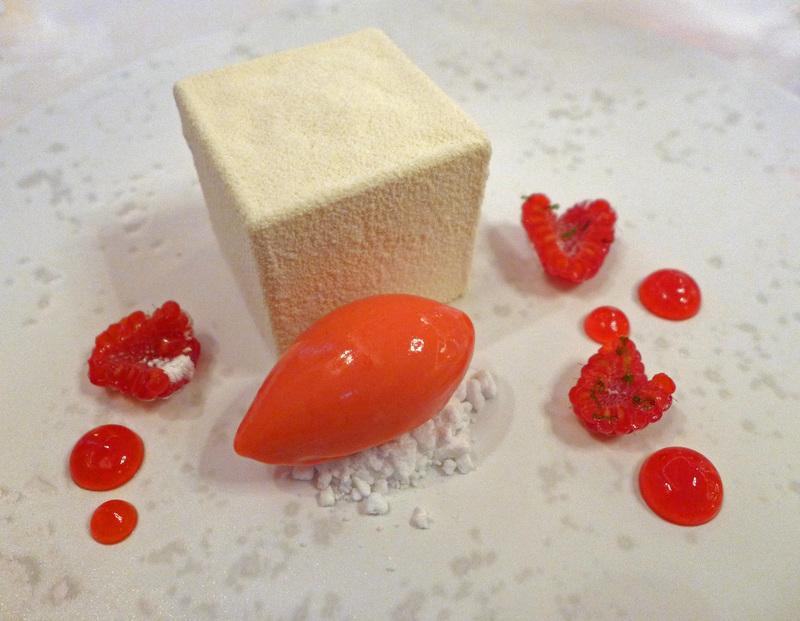 Raspberry and Lime – A very clean looking and mysterious little cube consisting of Vanilla mousse , White Chocolate Feulletine , Raspberry and Lime insert and Raspberry sorbet. 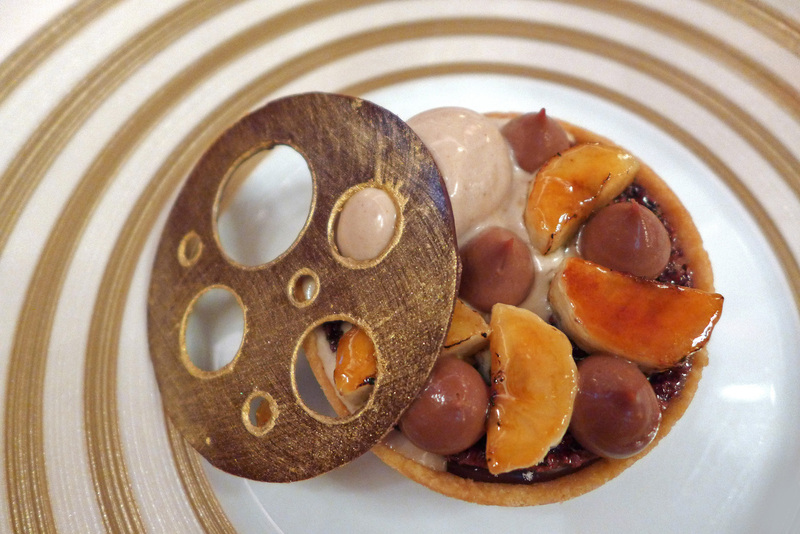 Banana and Hazelnut tart – What lies beneath the Chocolate masters creation here ?. The removal of a carefully crafted Gold dusted lid revealed the delights within. Hazelnut Ganache with caramelised Bananas , Hazelnut ice cream and Gianduja cremeaux. Coffee and Marsala. – The photo says it all. 10/10 for technical skills here and probably the best dessert of 2014. 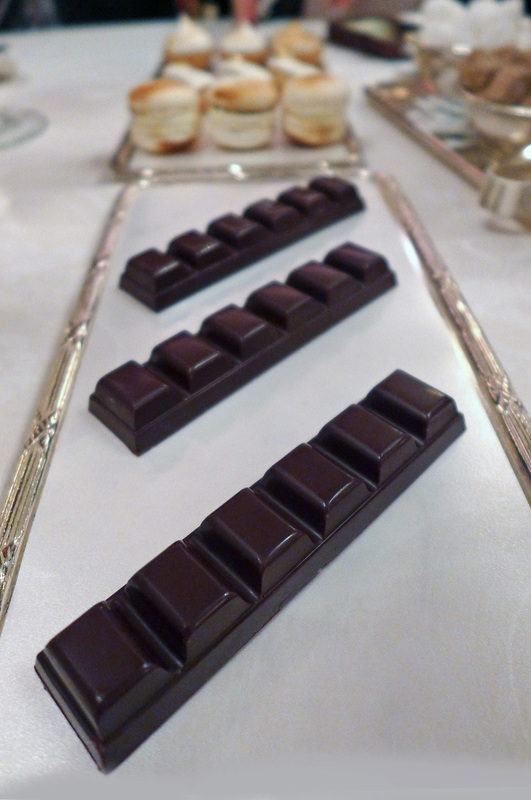 The chocolate cage was so fine that it almost broke from my breath alone. 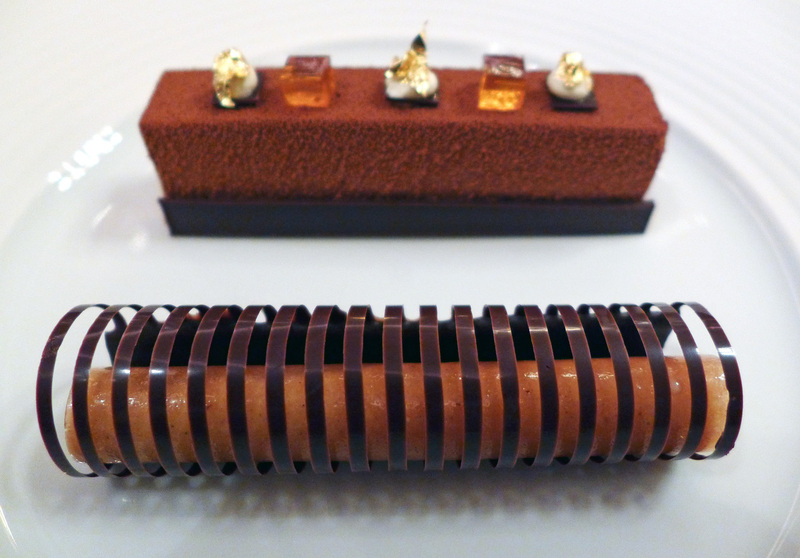 Chef informed me that the cage was created using tempered chocolate and a comb device on Acetate. This was then rolled up and allowed to set . 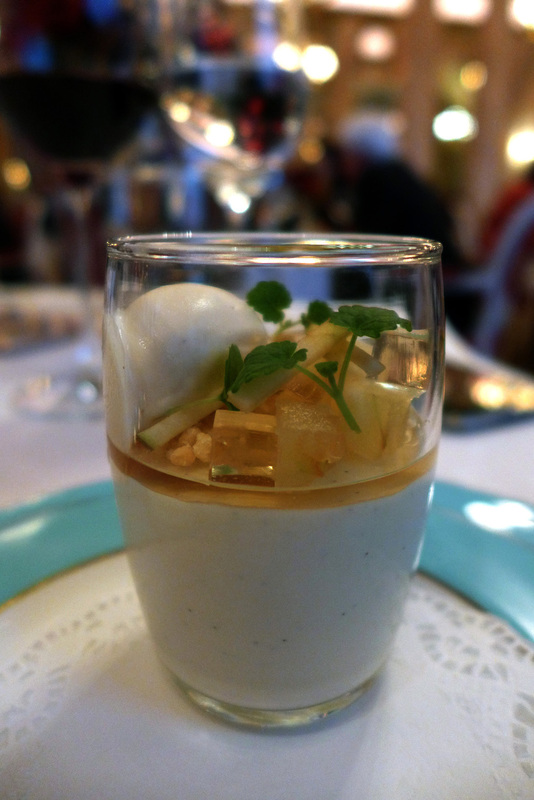 A work of absolute precision and the taste of the Amaretto and Marscapone Mousse….Ohhh wow. 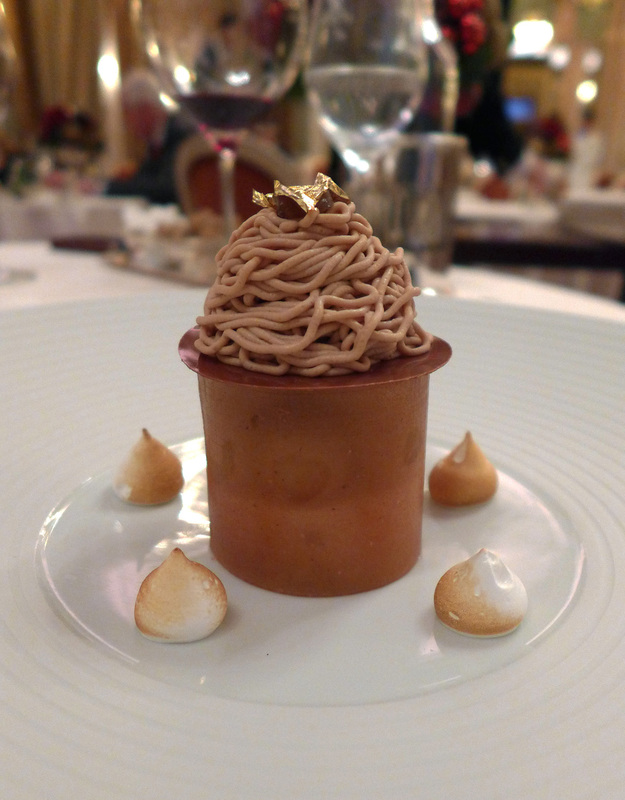 Mont Blanc – Yet another variation of the French classic Chestnut dessert. I think i`ve now had 3 different versions so ill look forward to the 2015 creation. This one was Caramelised Pear with Rum , Chestnut Chantilly , Rum ice cream and wrapped up in a crunchy Chocolate Sugar Tuille. 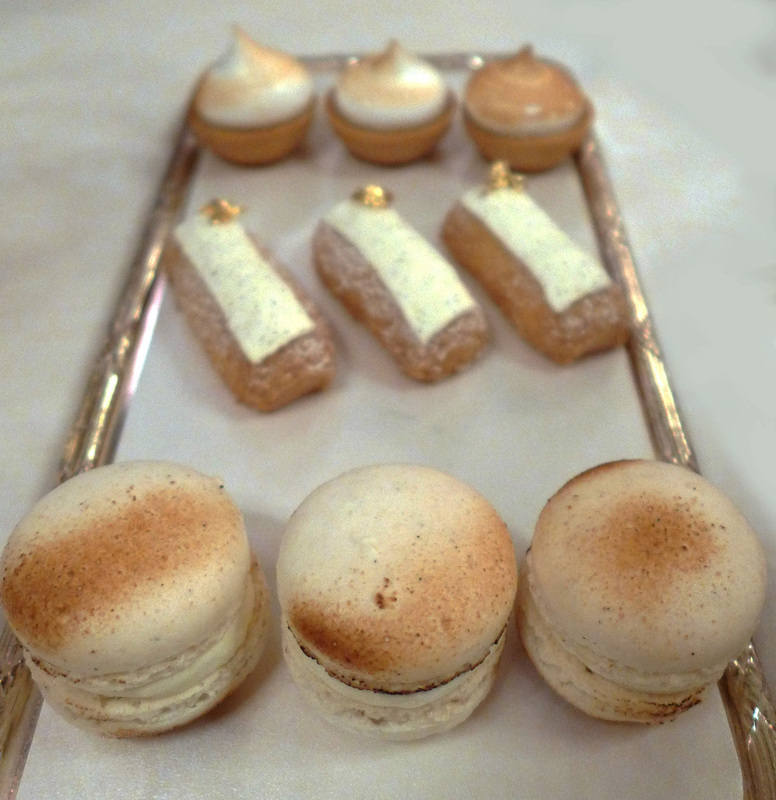 Sweet treats from the Ritz. Once again I had to leave early to catch the train back to Cumbria so I missed the beautiful sweet treats , a lazy Coffee and a little tour of the kitchens. Next time i`ve made my mind up…. I`ll book and extra night in London and for once I won`t have to rush off back to work again. Thanks to Lewis and the team at the Ritz for giving me such a wonderful end to a fantastic year. Now I just need to start planning something even better for 2015….Watch this space. 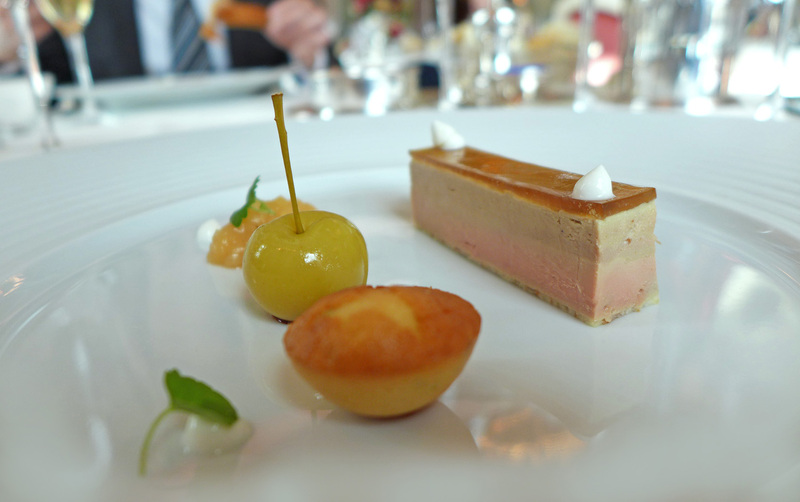 To view all of the photos from my Ritz Sunday lunch then please CLICK HERE. To follow Lewis Wilson on Twitter then please CLICK HERE. Previous Post FERA – At Claridges , London. Next Post Lake Road Kitchen – 125 day old Beef.